Balance supply and demand, optimize production processes, and avoid waste with sales and operations planning! Use standard planning (PP-SOP) to devise a simple production plan or use flexible planning (LO-LIS-PLN) to meet more complex planning requirements. Understand version management, forecasting, rough-cut planning, events, and mass processing to get the most out of your SAP PP implementation! 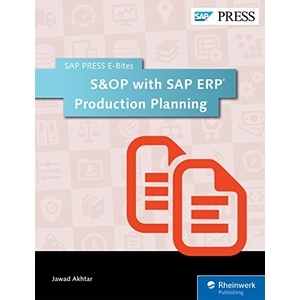 Jawad Akhtar is the author of three SAP PRESS bestselling books “Production Planning and Control with SAP ERP,” and “Quality Management with SAP”. He’s also the co-author of the SAP book “Materials Management with SAP ERP”. He has authored several e-books on SAP-centered topics and is a contributing author for book “Discover SAP”. Jawad earned his Chemical Engineering degree from Missouri University of Science & Technology, USA. He has 18 years of professional experience, of which 12 years are in SAP. He has completed several large scale and end-to-end SAP project implementation lifecycles in the areas of PP, QM, MM, PM, and DMS in the steel, automobile, chemical, fertilizer, FMCG, and building products industries. He also has worked as an SAP Integration Manager and an SAP Project Manager, and has been proactively involved in a business development and solution architect role for seven years. Jawad prolifically writes for some of the top SAP publications such as SAPexperts, SearchSAP and ERPtips. He’s the technical adviser for SAPexperts and SearchSAP in the SAP Logistics and Supply Chain Management (SCM) domains.